Wow, here we are. How did we get here? This is the last time I will be writing to you from the Land of Many Waters. Tomorrow, the 25th of July marks the 11-month mark since I first landed on the South American continent. I will be headed to the airport at 4:00 tomorrow morning, and at 6:45 I will be officially completing my commitment to live in Guyana for (almost) a year. My training and preparation to live here began in July of last year, so I’m going to just call this whole experience a year, despite it only being 11 months of actually existing in this country. School officially closed on July 3rd. There was a little bit of paperwork to be finished up on the 7th of July, so almost the entire staff returned to school on that day to wrap up the school year, but the kids were done the Friday before. As I’ve mentioned in previous issues of this newsletter, when the end of the term approaches, things get rather scrambled. The testing process, along with prepping for it, is very confusing and then, when it’s all over, the test need to be graded, which is a nearly impossible task when you still have to keep your students in order. This term was no different than the last two. Thankfully, my class was finished testing well before some of the other grades, so I was able to distract them by showing them video clips on my tablet while I tried to get the tests graded. By the time school was finished, I could hardly believe that an entire year at my job sight had already concluded. It seems to be typical Guyanese standards to have some sort of a sendoff for individuals who are going away. For me, there was a goodbye lunch and performances on the Wednesday before school closed. Each grade prepared songs that they sang to me after the faculty and I had a farewell lunch, which included cook-up rice, my favorite Guyanese dish. The songs the boys each sang to me were quite humorous, complete with plenty of off-key notes and forgetting of lyrics. It was perfect. On Thursday, the grade six boys graduated, along with the one student in my class who I’ve been pushing to be released from our school all year. Thankfully, the Gods have listened and he was able to walk in the graduation ceremony with the grade six class. The actual graduation was brief, filled again with songs sung by the younger boys along with speeches from some of the staff and teachers. In the end, I think it was a nice closing exercise for the boys. They have now gotten to experience finishing a portion of their schooling and are now prepared to move on to something larger, but perhaps not as daunting anymore, secondary school! After that extra day of work on Tuesday, I could hardly believe that I was handing over my key to the school. Part of me wanted the whole experience to still be in front of me. Part of me wanted to hang around for a second year. Part of me wanted to jump up and down in excitement for having survived. With 44 boys at the orphanage, it’s impossible to have a birthday party for each of them when their birthdays come around during the year. So, to counter this, the boys all have one large party in early July, right in the middle of the year. They get gifts, they have cake, they run around like crazy people, and everyone who loves them shows up to celebrate with them. This year, the party was the day after school ended. It was similar to other get-togethers that the orphanage has had throughout the year, but there were some added fun elements, too. I knew it would be one of the final “unofficial” times I would be with the group of boys as a whole, so I brought my camera and tried to wrangle boys together for photos as much as I could. This was a difficult task considering there was a trampoline to jump on, guests to chat and flirt with, and three piñatas to smash to pieces! Toward the end of the night, the boys were given their presents, which, unfortunately, were broken upon unwrapping. They were each given new watches, but so many of them simply didn’t work. I tried to remind myself not to feel too awful for them. Sure, there birthday gift which they could have waited all year for was broken, but they receive so much material stuff throughout the course of a year that losing a watch wasn’t a big deal. Still though, quite a bummer. The highlight of the party was watching the boys take swings at the piñata. It was especially funny when they would swing really hard and then miss the piñata completely. As I said, this month seems to have been one long way of saying goodbye to this life of mine in Guyana. One by one, my community members have driven to the airport, boarded their planes and vanished into the air, back to their real lives. I’ve been alone for a while now. Actually, it seems like quite a while. Ever since school ended, I’ve made it a goal of mine to get over the orphanage each day, but with no official schedule anymore, time seems to have slowed way down. I’ve been happy with this, for the most part. I wouldn’t want my final days in Guyana to feel like they were racing by me. Since the three people that I spent so much of this year with have departed, I’ve begun to see Guyana in a different light. I too will disappear into the blue skies over the Caribbean in just a matter of hours. That’s how this kind of existence has to end. Before I do actually peace out of here, I did get the chance last week to cross over into the bordering nation of Suriname for three days. It was a grand adventure for me, an experience I’ve been hoping to do since my arrival in South America. Knowing that Venezuela was difficult to access and Brazil was expensive to get into, Suriname was the one promising country that seemed doable to make a visit to. And so, after life in my house began to wind down, I got my tourist card, booked a cab, and the next thing I knew, I was cruising through the countryside of what was formerly Dutch Guyana. I’ve always wanted to do some international traveling on my own. I did it briefly in Africa in 2012 and have been itching to give it another try ever since. There is nothing like it. You have to be on your toes ALL of the time. It’s such a rush. You can read more about my trip into Paramaribo, the capital of Suriname on my blog. The best part about being the last person to depart from a year-long volunteer program is getting to tie up all of the loose ends—just kidding. It really isn’t too bad, but over the last few days I’ve had to create a check-list of things to do before this house sits vacant for the next month. Fill water jugs, bring donations to Salvation Army, write thank-you letters, empty the refrigerator, shop for non-perishable foods so the next group can eat when they get here, wash all remaining dirty sheets, take out the trash, sweep, sweep again, write apology note to the new residents because it will look like I didn’t sweep, stop off around town and say goodbye to important people, buy silly souvenirs that I never got around to getting this year, etc. I will say; however, that having an entire house at my disposal has been nice. I was able to get my suitcase packed early on in the week this week because I was able to spread my stuff out to get a good look at what can be kept and what needs to be donated or left behind. Now, I’m just re-wearing the same four shirts over and over again, washing as I need to before they eventually get shoved into my back pack the night before my flight. It’s a simply existence for me in this house now. Tea in the morning, a sandwich for lunch, maybe some roti and channa off of the street for dinner. Dozing to sleep on the couch before eventually moving to my room. It’s a final life right now. And every afternoon is still jam-packed with time with the boys. A fun piece of this past week has been getting to know two new people who are in Guyana for the week from the EU. I met them while we were crossing over on the ferry back to Guyana. Since they’ve been in Guyana this whole week, I’ve met up with them three times and have quite enjoyed hearing about their lives in the EU and also their current 7-month adventure backpacking across the entirety of this continent. I’m blown away by their courage, not to mention totally inspired. They depart Guyana tomorrow, one day before I do. The dreaded question: “so, what’s next?” Please don’t ask me this upon my return to North America, because I don’t have an answer for you. I don’t want to have an answer for you. I just want to be. I can; however, answer that question in the short-term. When my plane leaves here on Sunday, I will not be heading for the North American continent; however, I’ll be puddle-jumping my way over to a little island about 80 miles off the coast of Venezuela called Aruba. Heard of it? I’ll be spending a week there, exploring the island and likely going into complete mental and emotional panic mode multiple times throughout the week. Maybe I can get it all out of my system before August rolls around. At the conclusion of my week in Aruba, I’ll be flying to South Bend, Indiana where I’ll be taking part in a week-long conference for long-term volunteers who have been volunteering for more than a year. The conference is geared toward “transitioning your volunteer work into the work force.” It sounds completely lame and completely necessary. I’m New York bound at the end of that week. The rainy season was supposed to end in June. It stretched into July this year though. It’s still been rainy relatively frequently. On the 15th of July, our house flooded again. We had a few inches throughout the whole house. It didn’t effective nearly as much as it did the last time. This time, it just felt like routine, something else that needed to be dealt with. It was, actually, completely okay with me, knowing I would be moving out in just a matter of days. I won’t miss that kind of thing once I leave though. Ah, so this is it. I’m sitting in my empty, packed up bedroom in Guyana, pounding out this final piece of this final newsletter thinking (just briefly) about what is to come next in my life. I have to say, I’m proud of the way I have lived in the moment recently. While planning ahead is often a good thing, I’ve recognized through and through how vital being here in Guyana now actually is. I’m off to the orphanage when this entry is finished, to watch TV with the boys one last time. It will be completely ordinary, which I think is best. Saying goodbye to this year will be hard, but I feel ready to move on. There were times this year when I thought about signing on for a second year, but ultimately, I think I knew that my Guyanese experience, at least this time around, was only suppose to be 11 months. I’m trying not to let all of the good memories make me feel sad. I’ll remember them fondly once I’m gone. For now, I’m reminding myself of why I didn’t stay for a second year whenever I need to be reminded. Life down here is hard. There are so many different elements to it. 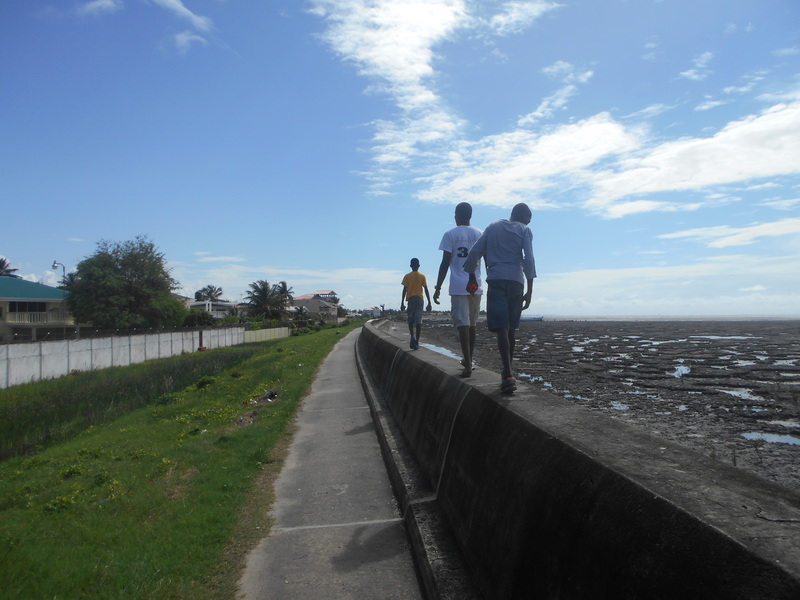 Walking the seawall with the boys. And so, we’ve reached the end. I’m planning on sending a note about how things are going for me in about a month. That will likely be my final GuyaNEWS correspondence with you. Until that time, thank you for reading this and every issue of GuyaNEWS that you got around to reading or skimming this past year. Your time is appreciated. I hope you enjoyed hearing about some of this crazy stuff and some of these crazy experiences. This entry was posted in Guyana, GuyaNEWS, South America and tagged closing, closure, Guyana News, Guyanews, recap, the end. Bookmark the permalink. Glad you are heading back to the states. While in Aruba you have got to do some snorkeling. Of the three islands I prefer Bonaire to either Curacao or Aruba topside. I think the ocean life is pretty similar. Enjoy!! !